Eric Dangling Sloth is hand made in the finest brown tipped cuddly soft woven fur. 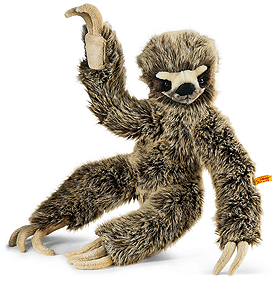 Eric dangling sloth is 45 cm long and brown-tipped faux fur is beautiful, soft and cuddly. His black eyes are surrounded by brown plush fabric. The brown colour of his mouth and the shading around the edge of his nose and snout, set in the middle of his cream-coloured little face, make him look adorable. His claws and the pads of his paws are beige. His bottom contains bean bags for optimal stability.